Quinn Design Associates collaborated with Diamond Schmitt Architects and RTKL to develop a site plan for Peel Memorial Centre. 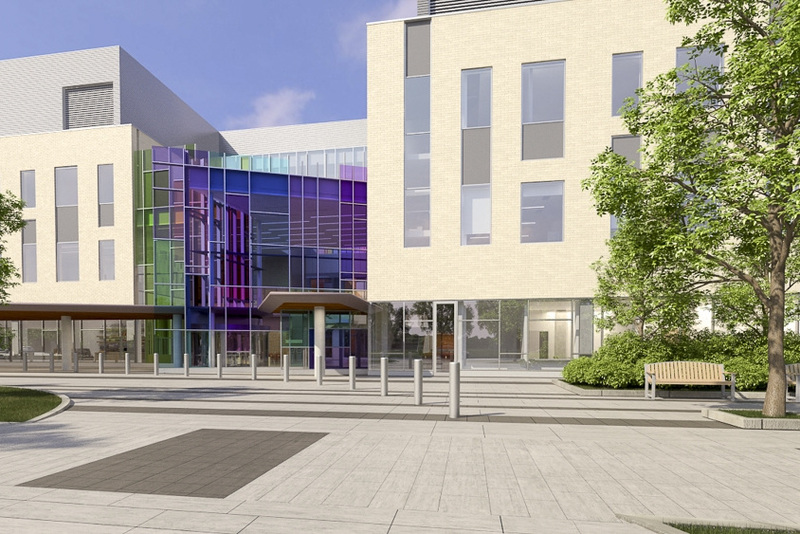 Our further development of the landscape design provides welcoming and functional outdoor spaces that support the infrastructure and design of the hospital, as well as the function and ecosystem of the site and surrounding area. Our landscape solution includes expansive lawn and planted areas, shade trees—including a ‘Green Spine’ double row of trees around and into the site—and pathways to create an inviting, park-like setting that ties into the surrounding community. The design provides opportunities for community interaction, gathering, individual contemplation, and fitness in a safe and accessible environment. Several interior therapeutic courtyards required designs to address the special needs of specific user groups, such as seniors in rehabilitation and people with mental health challenges. Our design response provides attractive, safe, and secure spaces that give hospital users a vital connection to the outdoors and to nature. Our documents for the project were produced fully in Revit, and include 3D studies, design sketches, and Site Plan Approval drawings.